In September 1643, the General Court of Massachusetts granted that Wenham should be a town in its own right and send a representative to the General Court. It was the first town to be set off from Salem. Because many of its early settlers came from Suffolk County in England, where there are two small villages, Great Wenham and Little Wenham. This page displays the First Period and Georgian houses of Wenham, Massachusetts. Black and white photos, and historical inventory information (INV) were provided by the Wenham Historical Commission in the 1980’s, and are online through the Massachusetts Historical Commission site (MACRIS). 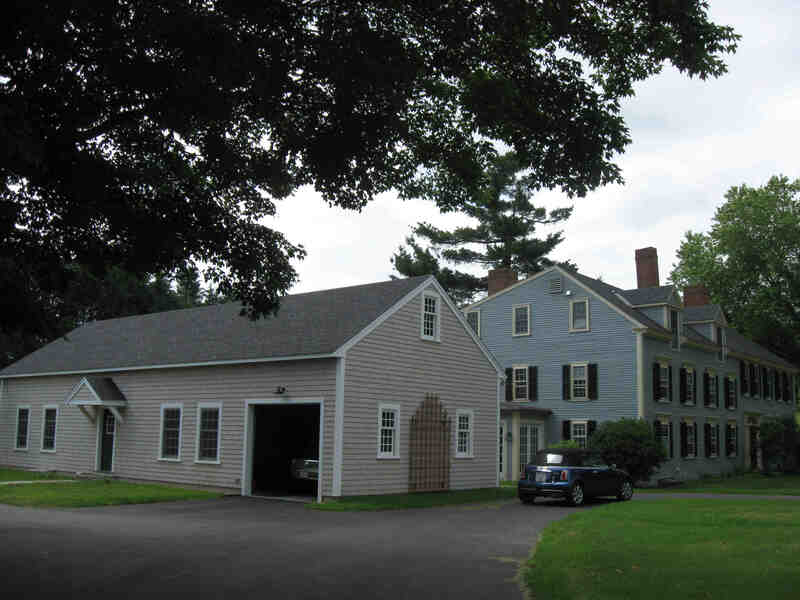 Color photos are from the Town of Wenham properties assessment data. The list is displayed alphabetically in order of street name. Some house numbers may have changed and some could not be found with a quick search of the town’s property data. Click on any thumbnail (from Patriot Properties) to view the photo. Click on the WNH link to view the house at the MACRIS site. 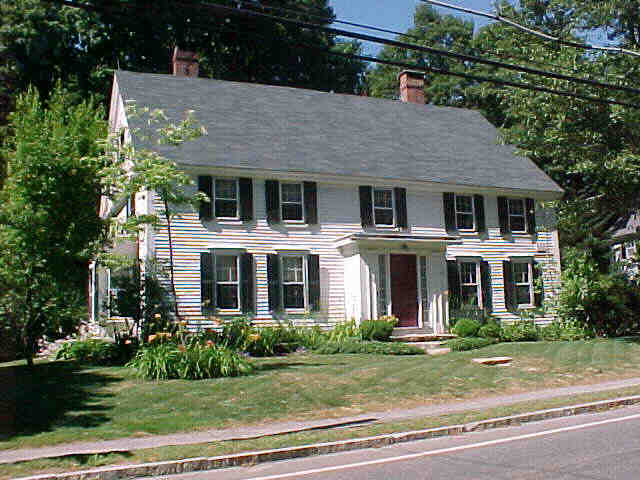 The Nehemiah Perkins house, 40 Cherry St., Wenham MA. Early 18th Century frame, remodeled after 1837. WNH.113, Kimball, Edmund House, 20 Arbor St, c 1742. This house was moved to this location in the 19th Century. WNH.117, Friend, James House, 114 Cedar St, c 1725. James Friend, (b.1633,) was a carpenter and hewer of timber. In 1691, the town of Wenham granted Friend and John Porter privilege to stop a brook “to set up a Saw mill…” on the brook across Topsfield Road from the house. In 1699 James Friend was granted liberty to cut timber on common land for 8000 shingle, perhaps in order to construct the house. WNH.119, Moulton, James House, 123 Cherry St, 1658. The house stands at the base of Moulton Hill. James Moulton, an early settler in Wenham, was granted land here in 1639. He was chosen constable of the town in 1657. The foundations of the original portion of’ this house are fieldstone, 4-8′ in thickness. An indication of its 17th. century construction is the girt in the second floor west wall where it projects into the rooms at the ceiling level. 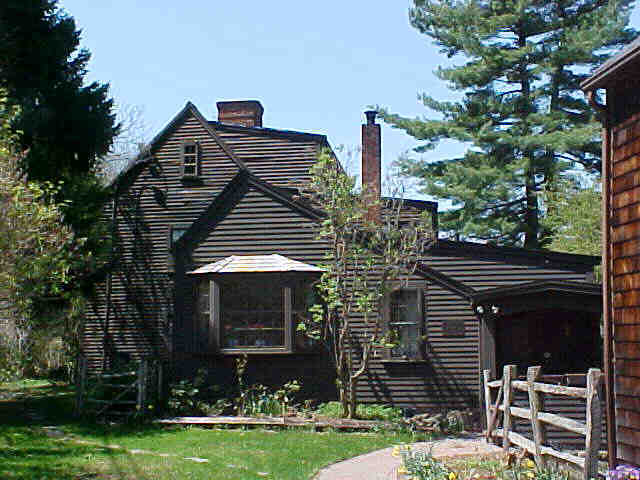 WNH.116, Newman – Fiske – Dodge House, 162 Cherry St, c 1658. The dwelling is associated with the Rev. Antipas Newman, the Second Minster of Wenham, a man of wealth. He married Elizabeth, the daughter of John Winthrop II, the founder of Ipswich. He owned the property between 1658 and 1672 and may well have been the builder of the house. By 1695/6 William Fiske, Jr. was the owner of the property. He applied to get trees from the common land of Wenham “for board and shingle, and for plank.” William Fiske was a member of the jury in the Salem Witchcraft trials in 1692. He later publicly apologized for his participation in the proceedings.The growth of the house from single to double cell plan within the First Period is typical of a larger number of First Period buildings, while the evidence of the raising of the chimney girt when the second cell was added provides insight into carpentry practices attendant to those enlargements. The quarter-round chamfer and lamb’s tongue stop without collar on the summer beam in the c. 1658 portion of the house is a good example of that relatively rare type. WNH.110, Larch Farm, 38 Larch Row, c 1700. Zaccheus Goldsmith, a Wenham yeoman who owned this property with Joseph Fowler since 1695, was given a town timber grant “for a dwelling house of forty foot long and twenty foott wide” here in January 1700. These rather unusual dimensions match the surviving First Period core and provide a well-dated example of the plank-framed Wenham rural farmhouse with single cell and original lean-to. The original core of the house began as a 40*x 20′ two story single cell plan with an original end lean-to room west of the chimney bay. After a 1963 fire the plank frame of the original house, jetties along the original south facade and east end, and elements of the internal frame were exposed. The original hall (now with the original chimney bay), presently the dining room, was located west of the south-facing lobby entry and first chimney. The old chimney was removed after the house was remodeled into a Georgian double pile plan by the north addition. The room’s longitudinal summer has flat chamfers and lamb’s tongue stops. The chimney girt also has flat chamfers and lamb’s tongue stops at its outer ends and on both sides of its juncture with the summer. WNH.86, Claflin – Richards House, 132 Main St, 1661. “The old MacClafflin house is structurally a very interesting survival of a style of building which is truly medieval in character. Rev. Joseph Gerrish spent twenty years of his pastorate in this house and it was a meeting place for his parishioners who at that time faced the demands of King Philip’s War and passed through the black period of Salem witchcraft, against which Rev. Gerrish took an active stand. Capt. Thomas Fiske Jr, 1693-1757 was the leading military man in town and was repeatedly elected to the legislature. In 1700 he was appointed to keep the first school here in the house. WNH.26, Hobbs, Henry House, 135 Main St, 1698. The Hobbs House was built in approximately 1688 and was rebuilt in 1760. It was known as the Deacon Foster House. Moses Foster was deacon of the Congregational Church in 1857 end representative from the town to the General Court of Massachusetts. He was Town Clerk from 1825 to 1829 and 1852 to 1859 Moses Foster was still in the house in 1856 but by 1865 Henry Hobbs had come to occupy the house and by 1872 his harness shop was in full operation. In later years the harness shop was used by the Wenhan Village Improvement Society as a summer tea house. 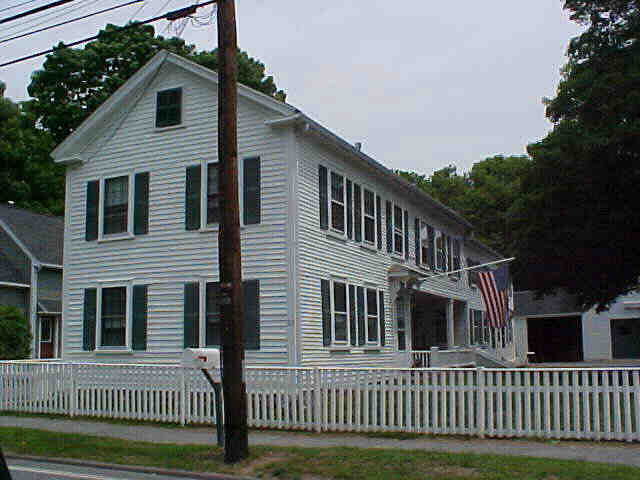 WNH.41, Rogers, Samuel House, 167 Main St, c 1746. A deed from Josiah Bridges to Charles Gott dated July 1, 1714, lists “a dwelling house barn shops & orchard” on 4 acres at what is now 167 Main Street, and the subsequent deed on October 5, 1715, from Charles Gott to William Rogers mentions “all my now dwelling house, bank-shop & orchard.” It is unclear what the relationship of these buildings may have been to the present house, which has been attributed to Samuel Rogers in 1746-50. In 1713, two years before acquiring the property, Capt. William Rogers, “the second person to have enjoyed the high military dignity of captain in ‘ye trainband’, had been appointed schoolmaster. Whether this is the same “Capt. Rogers” who was listed as a selectmen in 1735 has not been verified. Samuel Rogers, who is credited with building the present house and presumably the son of William, was Town Moderator 1752. WNH.74, Kimball, Capt. Jonathan Jr. House, 168 Main St, c 1759. House originally built all of one piece on land owned by Capt, Jonathan Kimball, Sr., who held a number of town offices.1 He ‘died in 1758, intestate, His estate was not totally settled until 1768. His real estate included the present Historical House, and an extensive strip of land along the east side of Main St., and the Samuel Rogers House across the street. The principal heir was Jonathan Kimball, Jr., who eventually disposed of the various parts of the real estate. In the inventory, this is described as ” Consisting’ of House and Lands ” The property came into the hands of Uzziel Dodge in 1796. It later was inherited by his son, Dr. Samuel Dodge. For a number of years, this was a two family house. 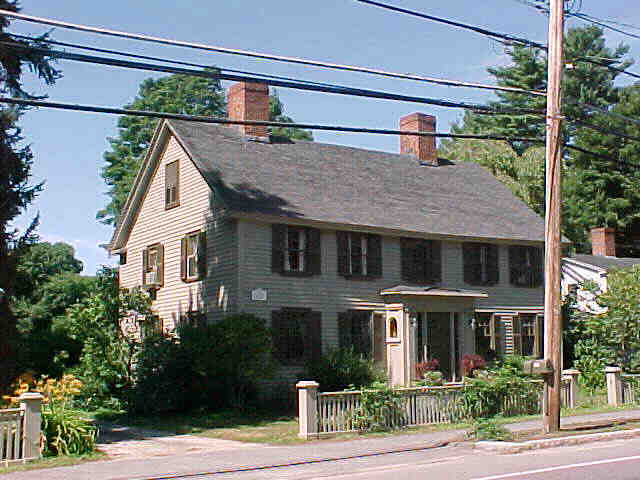 WNH.43, Brown, Peletiah House, 175 Main St, 1764. The house was built in about 1764 by Pellitiah Brown. By 1856 it was in the possession of Moses Mil dram and by 1872, A.R. 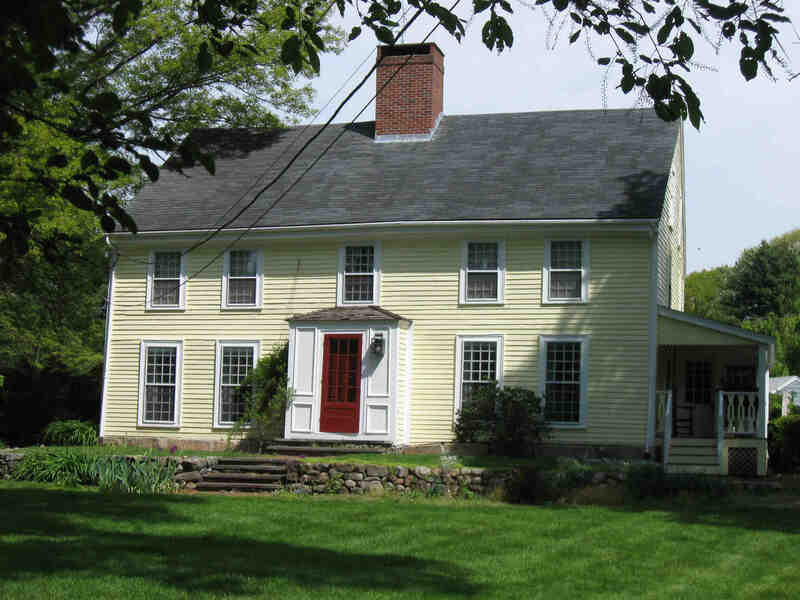 Fisk lived in the house and maintained a shop on the land between 175 and 175 Main Street. By 1884 Benjamin F. Young owned the house and remained in possession of it until its purchase in the mid-1900’s by Clarence Lunt. Mr. Lunt moved the house back from its original position near the road onto the present site. 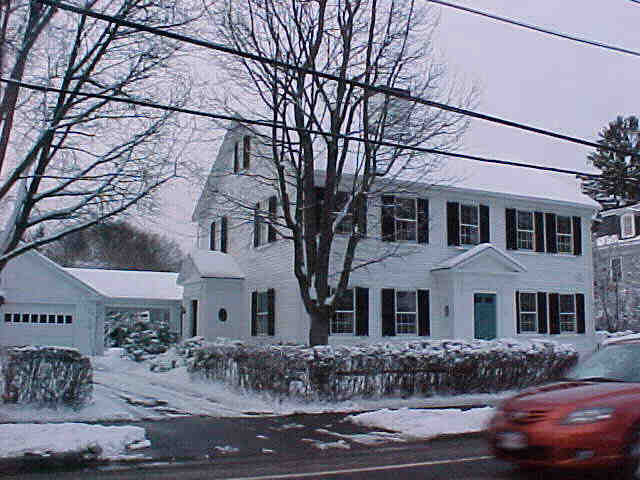 WNH.45, Hutton, Richard House, 185 Main St, c 1679. The house was built about 1679 by Richard Hutton. By 1856 it belonged to C.E. Killam but passed thereafter by 1865 to Capt. Creesey and later to H.B. Abbott. By 1884, El. Kimball was in possession of it^and the land designated as the Perkins lot at 187 Main St. was sub-divided in 1887 to allow the building of the James Perkins Jr. House, 187 Main St. By 1910 the giant lot with its two barns grid the Perkins lot sub-divided had passed to Clarence Kimball. 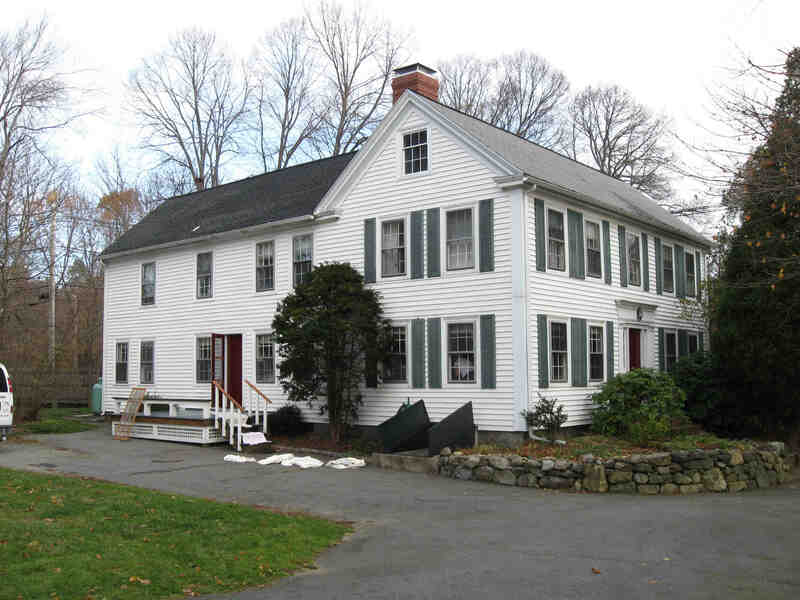 WNH.122, Old Farm, 9 Maple St, c 1689. 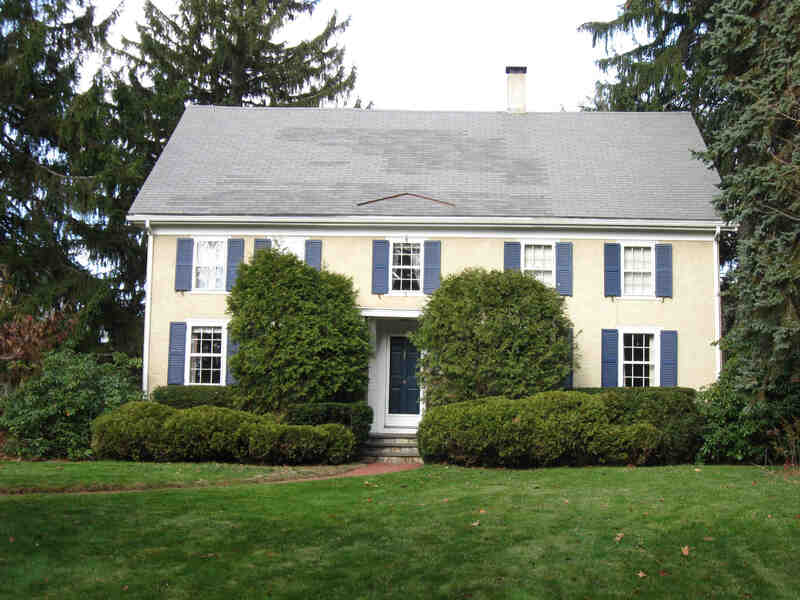 Old Farm is a First Period house restored in 1911 by Mr. and Mrs. Alanson Daniels of Boston. WNH.121, Kimball, Solomon House, 26 Maple St, c 1700. Land originally owned by Phineas Fiske, Examination of the present house indicates that it was originally built as a two-story house with a one room plan, having an entry with narrow turning stairs against a huge chimney. The ground floor room is nearly 2 feet longer that/f the room on the.left of the entrance door; thus this door is off-center. The placing of the corner posts at the left of the “entry and the passage above indicate, this as a southwest corner of the” original house, from which the house was extended at a somewhat later date. WNH.118, Kimball, Ephraim House, 31 Topsfield Rd, c 1697. Ephraim Kimball was the son of Richard Kimball and Mary Kimball, born Feb. 18, 1660 in Wenham. He came into possession of this house site probably in 1676, when his father’s estate was settled, and which he enlarged by further purchases & grants from the town. He died Oct. 16, 1732. This house was originally built as a 2 1/2 story structure, having a two-room ground floor plan with central chimney and turning stairs in the entry. The original foundations are of field stone, generally about 17 inches thick. The exterior walls were lined with brick between the studs. 35 Woodbury St., Hamilton MA. No date is available, but the owner claims that it was built in 1660, and he found waddle and daub insulation in the walls. He believes the two hearths and the entire central chimney were lifted to be placed on the brick arch in the basement. The original house has a central stairway, as well as summer beams with lambs tongues, some of which have been replaced. The salt box addition in the rear was added later. The name of the original owner or builder is not available.